John looked to his cellphone to check it for any text messages, usually if Watson was out for too long Sherlock would have sent him a text asking where the Army Doctor was.. or if there was a new case for him to meet him at some random place that the consulting detective wanted to have searched. The Army Doctor frowned lightly when he saw that there were no messages from his friend; he was not sure if he should take that as a good sign or a bad one. The worst thing that could happen is Sherlock sitting in their flat bored or shooting at the smiley face that is spray painted on the living room wall again. Stuffing his cellphone back into his pocket, John looked outside to see vehicles strangely parked right in front of the building that he and Sherlock called home. Great.. What did Sherlock do this time? Watson wondered as the cab stopped. Gathering the money from his wallet he handed it to the cabbie before scopping the bags up and quickly walked to the building just to be stopped by some men, "For bloody sake! I live here!" The Army Doctor exclaimed furiously before pushing himself past the gentleman and ran up the stairs. Walking into the living room he noticed some men in the room, not Lestrade.. nor Sherlock. The bloke looked nothing like Mycroft at all. Watson wondered just what had happened now as he stopped just in front of the doorway, "What's going on?" He looked around the flat expecting Sherlock to come into the room to explain what was going on, "Sherlock? Sherlock what is going on?" He looked down the hall towards the bathroom and Sherlock's bedroom. Not receiving an answer, John set the bags onto the couch beside him and looked to the stranger in the middle of the room, "Explain to me what is going on.. If you are looking for Sherlock he is obviously not here and will possibly not be back until much later tonight." He could see that the man was not looking though as he was assured, "I'm Sherlock's friend and assistant in his cases. I'm John Watson.." Watson looked to the man, thinking now it was time to here the other man talk now as he went into a parade rest stance. Coulson was standing in 221B Baker Street, getting in was not much of a problem, the hard part was getting the permission of one Mycroft Holmes, but in the end, SHIELD got permission to try and recruit Sherlock Holmes. SHIELD had established a perimeter around Baker Street, not that it was necessary, it was more of protocol. Coulson followed protocol most of the time, but he would improvise if necessary. Coulson was looking out the window of 221B Baker Street when he saw a person enter. Coulson took a moments glance of his face before the person entered, he then took up his phone, browsing through know associates of Sherlock Holmes. Coulson found the person that he just saw, Doctor John Hamish Watson, captain in the British army, honourable discharge. Watson was also Sherlock Holmes flat mate and a blogger who documented Sherlock's activities, well if Sherlock was recruited, the blogs would have to be censored..Coulson then put his phone back into his pocket, turned around and waited for Watson to enter the flat. "We know who you are Doctor Watson, forgive our intrusion, but meeting your friend is top priority." Coulson said in a polite tone, he then took out his indentification card, Coulson then added, "Agent Philip Coulson, Strategic Homeland Intervention and Logistic Department, you may have heard of us since the New York incident." 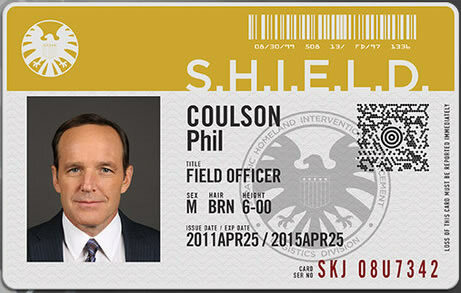 Once Coulson finished speaking, he place his identification card back into his coat. Coulson looked around the flat once more, he then extended his hand to Watson and said "Well I have all the time I need to wait for your friend." Watson looked to the man as he spoke.. of course Sherlock was a top priority on the list of every person to meet.. John was not surprised really. The Army Doctor looked to the card as it was presented to him, which he naturally inspected. Making sure that the picture matched the man's appearance. Which it did. Watson straightened himself, "SHIELD? Yes we have heard of your organization." Watson extended his hand and shook the other man's hand, "Well.. then you might as well make yourself comfortable. It will be a long wait." John retracted his hand and picked up the grocery bags as he walked into the kitchen. The Army Doctor set the bags down onto the coffee table before walking over to one of the two windows, looking down to the street below before closing the blinds when he noticed reporters gathering at the apartment windows on the other side, "Would you like anything? Tea? Water? Coffee? Or anything to eat? I'm certain your trip from New York has left you hungry.. plane food is not really that good." John said as he started putting the groceries away, "Are you having any jet leg? Or altitude sickness?" Watson asked as he carefully placed the eggs away from a certain object in the refrigerator.. He wondered why that bloody head was still in there. Watson knew better then to move it or get rid of it.. no matter how badly he wanted to. "That would not be necessary Doctor Watson, we had decent food on the ride here, our transportation was quite different than your normal plane." Coulson said with a smile, his personal command base was a massive plane which SHIELD spared no expense on, still it was not enough payment for the mint condition cards that Director Fury destroyed, they goes a life's works. Coulson then took a seat and opened up Doctor Watson's blog, to be honest it was rather interesting, and that was something when you find gods and aliens to be a days standard work. Coulson then asked "What can you tell me about Mister Holmes? Any topic I need to avoid when speaking to him?" SHIELD did not have the most accurate file on Sherlock Holmes, and his brother Mycroft did not wish to give them the file that already existed, thus Coulson would have to try and get as much information as possible. SHIELD had already broken into Watson's laptop a while ago, they got a copy of everything in it, and ensured that it seemed like nothing happened, but still the information on the computer was not enough. "Alright.. let me know if you change your mind." In the mean time, John fixed himself a cup of coffee just the way that he likes it and walked into the living room. The Army Doctor took a seat in his favorite chair and set the cup down on a placemat. He watched the other man for a moment wondering just what interest SHIELD would have with Sherlock. The man took a long, careful sip of his coffee, looking at the other man over the rim of his cup. Settling it back down he looked from the cup to Agent Coulson, "Well.. for one. Avoid making your case sound dull. As soon as you make your case sound dull you will instantly lose Sherlock's interest." He thought for a moment, "Don't make any threats or force him into anything. If he says that I am to come along and help.. allow it." Watson looked to his watch wondering what it was that made Sherlock leave the flat. John looked back to the agent, "and do not try to sound.. what he calls desperate. If you can manage those things you might just have the edge enough to get Sherlock to work with you." John picked his mug back up and took another sip, keeping his gaze on the other man. Of course John had his handgun hidden somewhere among his clothing.. although to someone who was not trained; he looked as though he was unarmed. Yes the across the room had a id card and sounded convincing.. Watson could not quite trust the stranger in the room just yet. The Army Doctor remained silent for a little longer, "Would you mind telling me why you are here looking for Sherlock? Why would an American travel across the Atlantic to London in search of one man?" "Easy enough, I can assure you, our interest in Sherlock is anything but dull, as for threats, we don't use those, their too likely to backfire, and on the subject of being desperate, we have no need of that, we could always find someone else." Coulson said as he continued to browse through Watson's blog. Coulson then noticed a gun on Watson, thus he said "Doctor Watson, care to place the gun on the table, I would not want anyone to actually get hurt today, and I can see why Mister Holmes would want you around, your stories are quite interesting to read, but if Sherlock does decide to work with us and insist you come, we may have to censor your blog, sorry about that, but it is standard procedure and for the greater good." Coulson then closed his phone once more and placed it in his pocket once more, at the same time he took out his gun and placed it on the table, as a gesture of good will, it was just that a gesture, there were other armed agents in the room. Coulson continued to sit in the couch and wait for Sherlock Holmes, it was then he heard Doctor Watson's question on why he was here. Coulson gave it a moment of thought and decided that telling Watson would be another sign of good will, "The reason why SHIELD is interested in Sherlock Holmes is that we are expanding our response team against threats to Earth, we do have to prevent another New York from happening." Watson shrugged lightly, "Well that all depends on your case.. if it is time sensitive or tricky Sherlock is the best one to come to for help. Sherlock has been able to solve crimes that someone else would have given up on or stopped the moment they reached a false deadend." He looked to the newspaper next to him and found that it was not neatly folded.. telling him that Sherlock was looking through it. So something had to have caught the detective's attention. The Army Doctor looked to where he had his gun as the agent spoke up about it, he looked back to Coulson and spoke up, as he took his gun out, " My stories are not the only reason Agent Coulson. I help with his cases.. and I have saved his life a couple times since we met. We are friends." John disarmed his handgun and placed every part on the table beside him. The Doctor was not worried about being caught off guard, he can quickly load and fire his gun.. quicker than most people. All thanks to his military training and being in a war zone. Watson thought for a moment, ".. You.. do know that Sherlock is a consulting detective.. not a super hero right? He's not like those blokes that were in New York.." He shifted a little in his seat, "And that he does have episodes of behaviors that those who do not know him will consider strange or.. inappropriate depending on what he is doing." The Army Doctor looked from the window to Coulson, "How exactly can me and Sherlock prevent another New York? You will have to have more than just two crime solvers to prevent it from happening again."